In 2010, I was living in a misty mountain town in far northern Vietnam. Many young Hmong girls would come to town from the surrounding villages to sell handicrafts and guided treks to tourists. A few steps from the hotel where I was living, there was a street corner where a particular group of those girls would often gather. I spoke to them regularly on my frequent walks through town, and we soon became friends. There was one especially who caught my attention – a bossy little thing with a sharp sense of humour, a big heart and a magic smile. Let’s call her M; some of you know her already. In 2011, no less than three of my friends from that group were abducted, spirited across the border and sold as wives in China. One was rescued after only six months, while M and P were never seen again. They were sixteen years old. In 2012, on the opposite side of the world, I resolved to return to Asia to find out what had happened to M. In 2013, having finally gathered the necessary resources, that desire became a reality. I was joined in my search by Moreno, an Italian cameraman. In the first week of 2014, M was able to contact her family in Vietnam for the first time in two and a half years, and Moreno and I set out to follow the trail of crumbs. 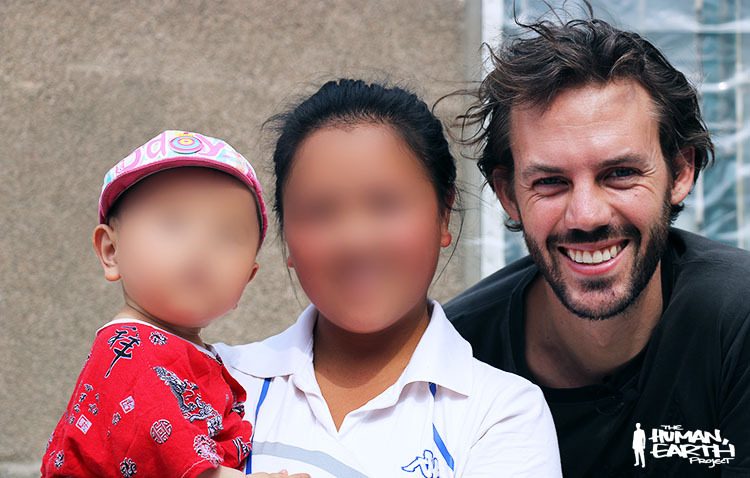 One month ago, we were able to locate and meet with P in southern China. We were given M’s Chinese phone number, and began to trace her location. It was clear that a meeting with M would be far more difficult to arrange, with her violently possessive “husband” (supported by M’s own father in Vietnam) aware of our presence and determined to prevent us from seeing her. Moreno and I arrived in the area eight days ago. It has been a long, strange week spent holed up in a little hotel by the railway station, receiving an endless series of phone calls from M and P. There have been tears and laughter, and protracted discussions of the past, present and future. This week, I’ve received a great deal of information about M’s abduction and sale, her present situation, and her thoughts and feelings on the major life decision she now faces – to remain in China with her child, or to return home alone. There have been many highs and lows, but when it came to arranging a meeting, the message was always the same: M very much wanted to see me again, but was certain it would be impossible. Moreno and I were determined to achieve the impossible. There are few things in this universe more stubborn than we two, but there are times when even we find our limits. Last night, we assembled a group of Asian, European and American ex-pats living in the area. Some of the women were willing to pose as our partners, to ease the mind of M’s madly jealous “husband”. I announced that Moreno and I would not be meeting with M, in the interests of her own safety. It was frustrating to have come so close and to leave without reaching our objective, yet it was the right decision, and all we could do. This morning, everything changed. M surprised us with the news that we could meet her with her husband’s knowledge and reluctant consent. After hoping against hope, Moreno and I didn’t need to be told twice; we were already there. In my mind, M was associated with a very particular place and time, a very particular street corner in a misty mountain town. We met today on a very different street corner in a flat and ugly place, in sweltering 39-degree heat and blustering winds. Many things have changed in the past four years. M now carries a child, and no longer wears her traditional Hmong clothing, but that magic smile is still the same. We’ll do what we can to bring it home, where it belongs. That smile is contagious, and I’ve been carrying it around all evening. I hope you catch it, too. Let’s send it around the world. We’re hoping to meet M again tomorrow to help her with her phone and email, so that she can contact Vietnam and the rest of the world directly. They say: Grant me the serenity to accept the things I cannot change, the courage to change the things I can, and the wisdom to know the difference. I say: A little less wisdom, a little more courage, and we can change the world.